Leaving your car at Terminal Fusina is not only the most economical solution, but it is also the most comfortable and the most exciting. 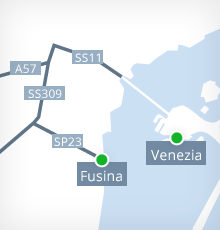 With Terminal Fusina you can arrive in Venice by ferry, crossing the south lagoon, and get off in the city centre, only fifteen minutes walk from Saint Mark's Square, or in Lido Alberoni. This is the first real excursion in the lagoon, but we have many others to offer to you every day. The latest motorboat acquired by Terminal Fusina Venezia. Big panoramic motorboat on two decks, a covered and an uncovered one. SPEND AN UNFORGETTABLE NIGHT IN VENICE! !